Skin Republic's award winning face mask range will be available in select Boots Pharmacies across the UAE from this November.Skin Republic is a dermatologist tested, hypo-allergenic range combining the latest advances in skin care with nature's restorative properties.Concentrated nutrient rich ingredients nourish, rejuvenate and hydrate, helping you to maintain healthy looking glowing skin. Skin Republic's range of six face masks are highly effective at promoting the intense absorption of nutrient rich ingredients deep into the dermis.Thanks to the Transdermal Delivery System, the Skin Republic face masks act as a second skin helping the skin to absorb the serum faster and more effectively than traditional creams and masks. 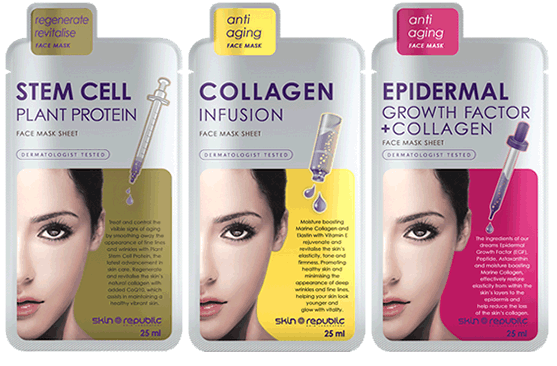 The award winning skin care rage contains some of the world's most advanced ingredients such as Stem Cell Plant Protein and Nano Platinum.Skin Republic's face masks are drenched in scientifically formulated formulations offering solutions to a variety of skin concerns. After the 15 - 20 minute application time, skin is super-charged, nourished and glowing with vitality.The perfect addition to your weekly skin care regime, Skin Republic face masks are most effective when used twice a week for the first month and then as required.Never has it been so easy to not look your age. Stem Cell Plant Protein Face Mask: This mask regenerates and revitalises from deep within the dermis using Stem Cell Plant Protein.With the ability to protect, prevent and repair aging skin cells, it assists in replacing damaged and lost cells with healthy new skin cells.The loss of collagen is also reduced and fine lines and wrinkles are minimised. Spots + Blemish Face Face Mask: This face mask helps cleanse the skin’s pores, clear spots and aids in preventing future breakouts with Tea Tree and Salicylic Acid.Witch Hazel helps tighten pores and stabilises the barrier function of the skin.These ingredients remove pore-clogging oil, control shine and reduce redness without over drying, helping to maintain a healthy and clear complexion. Collagen Infusion Face Mask: Moisture boosting Collagen and Elastin with Vitamin E, rejuvenate and revitalize the skin's elasticity, tone and firmness.Healthy skin is promoted and the appearance of deep wrinkles and fine lines are minimized, helping skin to look younger, firmer and glowing with vitality. Platinum Lift Face Mask: A formidable anti-oxidant face mask that fights environmental damage.Nano-Platinum, Trehalose and Pomegranate are some of the most powerful known anti-oxidant ingredients.They assist in firming and lifting the skin, enhancing it's elasticity and texture.In addition Platinum is well known for its anti-aging properties.After applying this mask, the skin will be left feeling firmer and toned. Brightening Vitamin C Face Mask: Infused with brightening and radiance enhancing ingredients such as Vitamin C, Vitamin E and seven Plant extracts, this mask will gently reduce the visible appearance of freckles, age spots and imperfections for an even skin tone.The Brightening Vitamin C mask will revitalise and brighten the skin while providing hydrating nutrients to reveal a radiant, bright and luminous complexion. CoQ10 + Caviar Face Mask: This intense repairing and restorative mask will give skin the nutrition it needs.Caviar is rich in vitamins, micro-elements and amino acids, key elements in skin cell regeneration.CoQ10 is a naturally occurring enzyme found in every living cell in the body. It is essential for good health and plays an important role in maintaining vibrant, youthful-looking skin.By bolstering levels of this important enzyme within the skin, skin is repaired and nourished whilst elasticity is enhanced.Witch Hazel, an astringent and antioxidant, helps protect the skin and reduces redness, maintaining a youthful appearance. As the skin has a four week regeneration period, Skin Republic’s face masks are most effective when used twice a week for the first month and then as required. An application takes between 15 - 20 minutes and any excess serum can be applied to the neck, décolletage and hands.